JFrog handles all your artifact management from the development floor through to distribution on the Artifactory – Bintray axis to stream liquid software through your CI/CD pipeline. 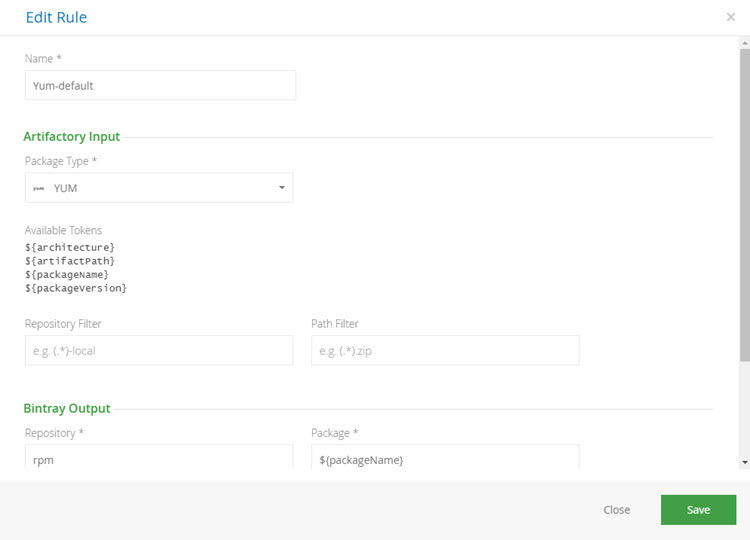 This integration already gives you visibility of packages hosted on Bintray, lets you search through Bintray and lets you push artifacts to Bintray either as single files or as complete builds. Distribution Repositories take the Artifactory-Bintray integration to the next step offering a quick and easy way to move artifacts and builds from Artifactory to Bintray for distribution to customers and end users. As opposed to local, remote, and virtual repositories in Artifactory, distribution repositories are not restricted to a single package type and can manage any number of packages in any format. How packages in different formats are handled is managed by the rule engine. The rule engine lets you define a set of rules that govern how files passed to the distribution repository are uploaded to Bintray. A new distribution repository comes with a pre-defined set of rules which you can modify, delete or add to as needed. Each rule specifies a set of conditions which the package must meet in order to “pass” and therefore be uploaded to Bintray. Conditions include package type, repository filters and path filters which are specified using a set of tokens and wildcards. This powerful feature offers enormous flexibility to automate how different packages are uploaded to Bintray for distribution to continuously update software systems and devices. For example, using a single rule you can specify that jfrog-artifactory.zip will be deployed to a repository in Bintray called zip-artifactory, while jfrog-artifactory.rpm will be deployed to a repository called rpm-artifactory. Distribution repositories have brought JFrog Artifactory and JFrog Bintray closer than ever before, emphasizing a single platform that handles all your binary artifact management from development through distribution.